See how they politely ask for "No Profanity in Team City please"? Go figure. So my team is now officially located in Lewisville. If you'd like to join and pledge to lose some weight while benefiting Second Harvest just go to www.pfpchallenge.com and sign up. You can do it individually or as a team; if you'd like to join my team the name is Lewisville Designated Losers. Let me know if you run into problems by leaving me a comment on this post and I'll get back to you as soon as I can. This entry was posted in Lewisville, Winston-Salem and tagged lewisville designated loser, profane, winston-salem on January 25, 2011 by Jon Lowder. Tried to join, but no luck. I searched by city and team name. Apparently my first team didnt get saved somehow so I went back in and set it up again. 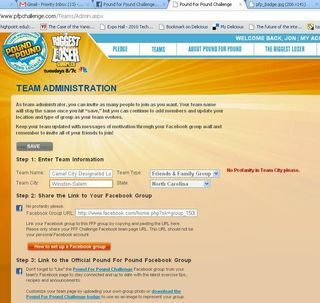 If you go to pfpchallenge.com and look for Lewisville Designated Losers you should be able to find it now. In this context being a loser is a good thing. I hope to have a big L on my forehead.